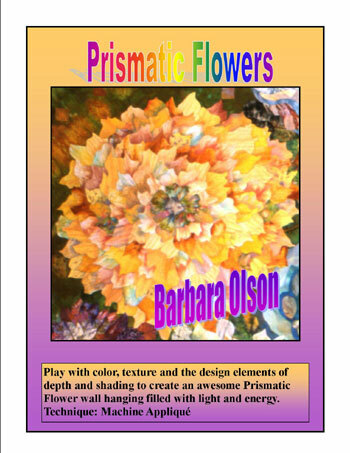 Workshops: PRISMATIC FLOWERS Play with color, texture, depth and shading. BEGIN AT THE END For the quilter whose borders are often overlooked. 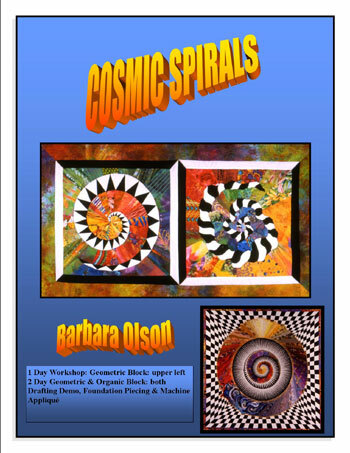 COSMIC SPIRALS Learn the techniques Barbara uses in her award-winning quilts. 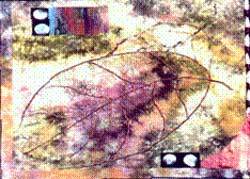 INTUITIVE IMAGES Use relaxation and music to tap into innate designs. MYSTICAL CASTLES Translate Barbara's castles into your own unique creation. RESPONDING TO THE SURFACE Creative impulse creates a powerful piece. PHOTO INSPIRATION Design a unique vacation memory quilt. JUMP START YOUR CREATIVITY Experience a playful way of creating. THREAD CREATES THE DESIGN Take top billing - Quilting makes it special. 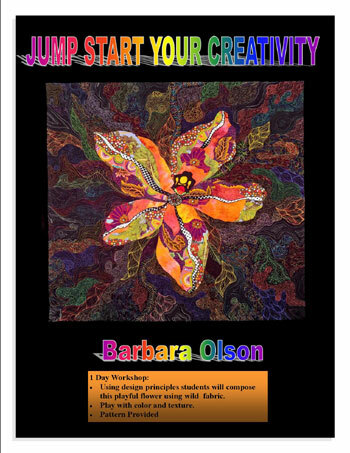 STUDIO: EXPLORING YOUR CREATIVITY For the more advanced quilt artist. Lectures: QUILTING A LIFE Take a wonderful journey through quilting. DESIGNING OUTSIDE THE LINES Find and understand unique ways of creating. Playing with color, texture, depth and shading, students will manifest a small flower piece filled with light and energy. Choosing from one of Barbara's flower drawings eliminates the drafting and allows students to go right to designing with fabric. A wonderful variety of multi colored shaded fabrics. 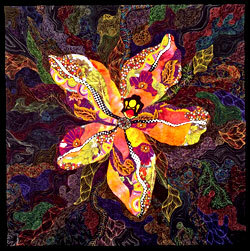 Batiks, hand dyed, painted or marbled fabric and some novelty flowered fabrics. Solids or calicos do not work. This is only a beginning. Creating these textual prismatic flowers involves lots of thread and is addictive. Fabric: Choose a color that you like best for your flower and bring 15 fabrics pieces and/or scraps which are multi colored fabric containing this color. You only need small pieces for the petals (1/4 yard or smaller pieces) Give yourself many choices. i.e. Red Flower Fabric Requirements - Red fabric with yellow areas, Red with pink areas, Red with green or blue areas, Pink with fuchsia areas, any multi colored fabric containing red. 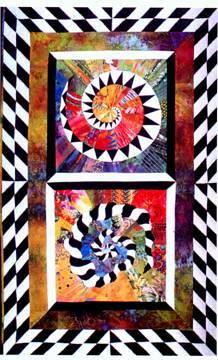 This workshop is for the innovative quilter whose quilt borders are often an after thought. Students will create a totally integrated small art piece, beginning with a foundation pieced border full of curves and some geometric shapes. Then its on to the main body of the quilt composed of geometric shapes and some curves. Machine appliqué piecing and foundation piecing techniques will also be used. Length: 1 day or 2 day. A 2 day workshop allows students to enhance composition and complete their quilt top. Sewing Machine Machine must be in proper adjustment and have zigzag capabilities. Students must be familiar with machine. Optional Lingerie/Bobbin for bobbin - used in machine appliqué. 3 yards Sulky Totally Stable White at least 18” Wide or comparable foundation that is transparent enough that a drawing underneath can be seen and traced. Fabric: Students should bring 20 or more 1/4 yard or larger pieces in a wide variety of fabrics such as batik, hand dyed, hand painted, colorful prints, and stripes. They will want to have a range of dark, medium and light tones. Many choices of pleasing combinations of color and texture work best. Smaller fabric swatches or scraps also add to the variety of choices. 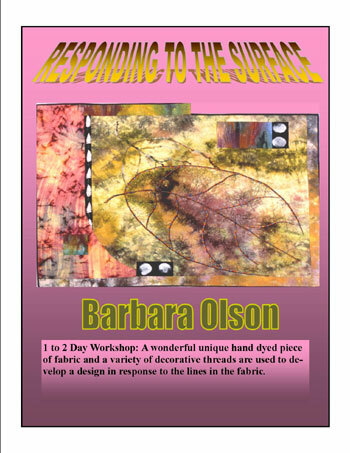 Students will learn the techniques Barbara uses in her award winning quilts for designing and constructing magical spirals, and will begin a small wall hanging containing one 18” block. Foundation piecing is used to achieve precise points for the geometric black and white spiral. Color is then added to the next round of the spiral with strips to complete the block. Drafting of the spiral will be demonstrated, a preprinted pattern will be provided. Many design options will be discussed. 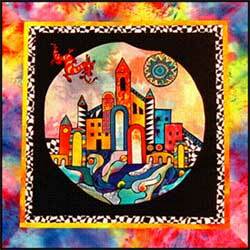 A two day workshop will include a foundation pieced, machine appliquéd organic spirals block. Foundation Material 1 Yard Sulky Totally Stable at least 18” wide or comparable foundation that is transparent enough that a drawing underneath can be seen and traced. Black Permanent Ink Felt Tip Pen Sharpie extra fine point is best or similar permanent marking pen. 1/2 Yard of a Multi-Colored Cosmic Background Fabric (Fabric that surrounds the two blocks). 2 DAY WORKSHOP: Add 1/2 yard Sulky Totally Stable & change white fabric to 3/4 yard. Students will use different techniques such as relaxation and music to tap into innate design abilities. Experimenting with freehand drawing and different ways of creating (centered or chaotic; intimate or engaging; implied or literal etc.) helps each student to understand their natural creative style and translate their drawing into a powerful art quilt. Drawings will be developed into full scale design and students will be working on the wall with fabric, color and texture. As designs progress, the instructor will work with each student to assist with problem solving and appropriate construction techniques for their composition. Quilting and embellishing will be discussed. 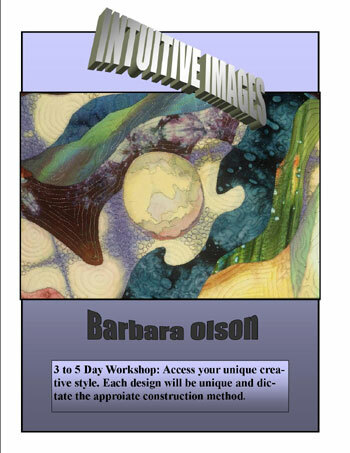 Best if 3 or 4 days workshop for more in-depth treatment of designs. Level: For students that have taken different technique and design classes and are now interested in developing there own unique style, or for the artist exploring fiber as a medium. Also for the adventuresome beginner interested in going directly to original design and is self motivated. Template Material 3 yards Sulky Totally Stable at least 18” wide or comparable product that is transparent enough that a drawing underneath can be seen and traced and one side of the product can be ironed to fabric. Freezer paper will not work unless it is transparent. Glue Stick - Note: must be restickable or repositionable Clover Glue Stick or Scotch brand by 3M is best and available at most office supply stores. Fabric: Students should bring 30 or more 1/4 yard or larger pieces in a wide variety of fabrics such as batik, hand dyed, hand painted, colorful prints, and stripes. Have a range of dark, medium and light tones. Many choices of pleasing combinations of color and texture work best. Smaller fabric swatches or scraps also add to the variety of choices. Bring items from nature rocks, leaves, shells, feathers, etc. What is your vision - The Emerald City; Shrouded Castles; Mountain Fortress; Ancient Pavilions; Temples of the Spirit? Playing with color, texture, depth and shading, students will experience the joy of translating one of Barbara's castle drawings into their own unique creation. Fusing will be used to construct a small wall hanging and machine appliqué will be demonstrated. No sewing machine required for class. 20 or More 1/4 yard or larger pieces in a wide variety of fabrics such as batik, hand dyed, hand painted, colorful prints, novelty prints and stripes. Have a range of dark, medium and light tones. Many choices of pleasing combinations of color and texture work best. For more variety of choices bring some of your small fabric pieces or scraps. Students may want to share fabrics. It is hard to go wrong if you bring lots of fabrics in many colors and varieties. For Feathers 15 or more pieces of fabric. You can use 1/4 yard, fat quarters, or a jelly roll. Fabrics with lines, veins, textures and shading in lights and mediums work well. Use a 1/4 yard novelty print for the center. The creative impulse will be combined along with one of a kind hand dyed fabric and nature’s lines and colors to create a powerful fiber piece. Students will develop a surface design in response to the lines and color of their fabric which has its own strong voice. In the morning students will use visualization, to develop a spontaneous design, in response to the fabric. By afternoon, central design will be satin stitched on the fabric. Decorative threads and machine embroidery and free-form organic quilting lines will add texture to the composition on the second day. Length: 2 Days - Option: 1 day - students create a small design and begin machine quilting. Techniques: Learn Innovative surface design. Machine embroidery, and intuitive quilting. Sewing machine must have a darning or free motion foot, and the feed dog must have lowering capabilities or a plate that covers it. Thread Invisible and Regular neutral colored thread; a variety of colors of decorative thread for embellishment - metallic, silver, variegated satins, etc. Fabric: Students should bring a 1/2 yard or larger piece of hand dyed multi colored fabric with interesting lines and colors. Batiks will work but a unique hand dyed is better. Also bring 4 coordinating 1/4 yd pieces and a 1 yard piece of fabric for backing. Design a unique vacation memory quilt. One moment frozen in time by the camera can be brought to life with cloth, texture and color. Using a photograph as an inspiration students will do a small line drawing. Drawings will be an interpretation of the image, not an exact replication. Drawing will be developed in fabric. Construction method is machine applique. 1 Sheet Mylar at least 8 1/2" x 11"
20 or More 1/4 yard or larger pieces in a wide variety of fabrics such as batik, hand dyed, hand painted, colorful prints. Have a range of dark, medium and light tones. Many choices of pleasing combinations of colors in your photograph. 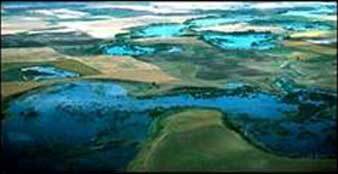 Examples: Glaciers; Brings whites, blues, light pinks, yellows and teals. This technique is for the quilter that is ready to break out of the box and experience a playful way of creating. Too much thinking or fear often stops quilters from trying new designs and fabrics. A simple flower pattern is the first ingredient, a wide array of wild, powerful & playful novelty fabrics (polka dots, geometrics, floral's, etc.) and few solid fabrics is the second ingredient and willing spirit is the third ingredient. A pattern will be provided. Sewing Machine with Zig Zag capabilities. A variety of 12 or more 1/2 yard pieces of fun/playful novelty fabrics. The fabrics could be polka dots, geometrics, large floral's, etc. Give yourself many choices don’t worry about coordinating. 4 or more 1/2 yard pieces of solid or fabrics that read solid that could possibly go with your collection. 1/4yard piece of a high contrast fabric Could be black & white. i.e. Pull a playful selection of novelty fabric from your collection or library of fabrics. What better fabrics to work with to get the brain out of the way. This is not a struggle of matching fabric for a perfect quilt. Trust your instincts & pull fabrics for no other reason than it looks fun and playful. Sewing Machine - Machine must be in proper adjustment. Students must be familiar with machine. The machine must have a darning or free motion foot, and the feed dog must have lowering capabilities or a plate that covers it. Studio is for the quilter/quilt artist who has taken all the classes they want to for a while, but want to be in the retreat environment with other quilters, have a recognized instructor available to them and an abundance of vendors. For the person who wants to explore a new idea for a quilt or continue working on an existing quilt. Barbara would be in the studio available for help with problem solving and techniques. You determine your own goals, Barbara offers a supportive environment with suggestions, challenges and motivation if requested. This is an uninterrupted time to focus and create your own personal quilts. Workshop Description: Fabric is an up close and tactile way of expressing the creative impulse. 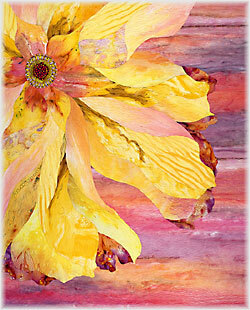 reate an imaginary flower by using fabric like a paint brush stroke. 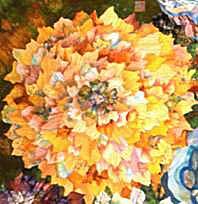 The brush stroke can be linier, to direct the eye, or textural, to add shading and depth. A simple flower pattern is the first ingredient. A pleasing combination of fabrics with directional lines and textural effects to create shading is next. A range of lights, mediums, and darks helps add depth to the petals. A few accent fabrics that add highlights and interest completes the design. This flower is only the beginning. This technique can be used in all types of quilt design. Jumpstart Your Creativity Kit - Available HERE Kit Includes 2 yards Sulky Totally Stable, 1 package Steam-A-Seam, Repositionable glue stick, Superior Mono-Poly and Bottom Line bobbin thread, Sharpie marker. 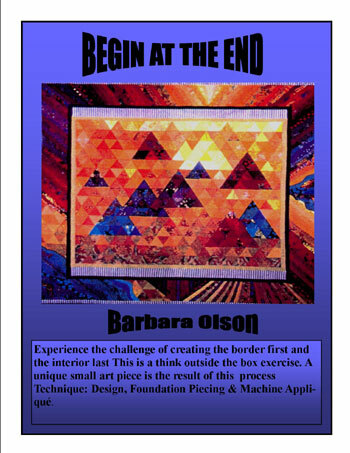 Lecture Description: Barbara takes listeners on a wonderful journey through quilting and creativity to purpose. 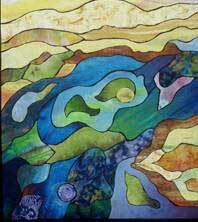 She shares her evolution from quilter to quilt artist and shows many of her award-winning quilts. More importantly, she discusses the tools, which helped her understand her life’s purpose. These invaluable tools help listeners expand their creativity, and develop their natural talents, in whatever area they may be. What is my purpose? Seems to be the question that is on everyone’s mind today. This is an important lecture for anyone wanting to expand their creativity and to begin to know their life’s purpose. Lecture Description: Each person came into the world with an innate way of creating. How to find and understand that unique way of creating is the topic of this lecture. Great artists bring their full energy and uniqueness to each piece. 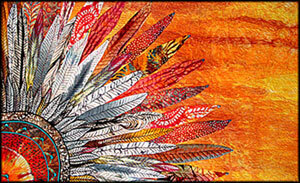 Creating with joy and purpose manifests wonderful quilts. The frame work that quilting offers is a good place to begin the process, then to go beyond the boundaries and design outside the lines. Table space sufficient for sewing machine, mat and elbow room for each student. A class of 20 students is preferred, with a maximum of 25 students, provided classroom size allows. An additional fee of $25 for each student in excess of 20 will be charged. All travel costs including air coach, extra bag fee, parking and ground transportation in transit or destination city. If appropriate, travel by auto will be charged at Government rate. Rental car, if required, will include full coverage insurance fees. All food and lodging, with hotel or motel accommodations preferred. All arrangements must be approved in advance.